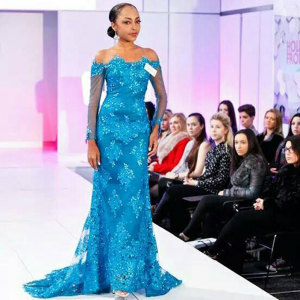 For the first time, a Miss World British Virgin Islands is attending the international pageant with outfits that were created by a BVI designer. Miss BVI World, Rosanna Chichester departed the Virgin Islands on November 20, destined for London where the 64th Miss World Pageant will be held; and with her she took at least 12 customized pieces from BVI Designer Germaine Smith. Mr. Smith has been dressing pageant queens of the BVI for years, and many of his gowns have graced numerous international stages. However, as Rosanna posted photos in the beautiful turquoise gown that was designed by Germaine this week many took note. In an interview with the Island Sun newspaper, Germaine disclosed that the sheer and tapered gown took four days to create, and is made with french lace, four layers of mesh, carefully placed appliqués and 800 swarovski stones. The dress is more than just a thing of beauty, but also tells its own story. Germaine said that the colour boasts of the sparkling waters of the BVI, and the beauty of all of the islands. He said the small train tells the story of Rosanna’s journey, while the long sleeves highlight the diversity of the Territory. “I am very intrigued to have been granted the opportunity to be her personal stylist, and highly motivated by my crew Zoe McMillan, and Antony Jeffers… Working with Rosanna has enabled me to show my skills and gave me the opportunity to push boundaries..It also gave me an opportunity to let people or persons know that there are talents and abilities in the BVI that can be showcased at an international level,” the Designer said. Germaine also thanked his wife Judith Perkins-Smith, and Susan Rymer who he said are his motivators, biggest fans, and cheerleaders. “They strongly believe that I am the best,” he told the Island Sun. The work continues, as Germaine is now working on the wardrobe for Miss BVI 2014 Jaynene Jno Lewis.